Maybe it’s the unseasonably warm weather, a pregnancy-related pumpkin aversion or simply a case of pumpkin burnout, but I haven’t really felt the insatiable need for all things pumpkin spice the past couple of weeks. Okay, it’s really not quite as tragic as I make it sound because this spiced chai breakfast quinoa is totally filling any fall flavor void in my life at the moment. Fellow chai-lovers, you’re going to want to get in on this. Just make sure you bring your appetite because this is one filling breakfast bowl. Speaking of appetite, I never thought I’d say this but eating for two is a tough job. I kid, I kid. I’m not technically eating for two (at least not all of the time), but at this point there’s no longer space in this belly of mine for big, satisfying meals, which means I’m hungry and on the hunt for food every couple of hours or so. 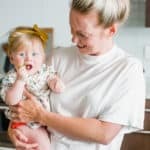 One thing that’s consistently made a difference in keeping me satisfied, both before and during pregnancy, is getting enough protein in the morning, something that many irresistible (I’m looking at you, cinnamon buns and almond croissants) or ridiculously convenient (ahem, granola bars) breakfast foods typically lack. I guess it’s not surprising that Americans average just 13 grams of protein at breakfast, but did you know we should be shooting for about 25-30 grams at each meal? The timing and type of protein we eat matters more than you may realize. We tend to eat most of our protein in the evening though, leaving our mornings low in the nutrient most likely to keep us full. Getting enough protein in the morning means you’ll feel fuller, longer and are less likely to be grazing for mid-morning snacks or overdo it at lunch. Alone this bowl of chai goodness packs an impressive 22 grams of protein, but pair it with an 8-ounce glass of milk and you’ll get in a whopping 30 grams (!!!) before you even walk out the door. 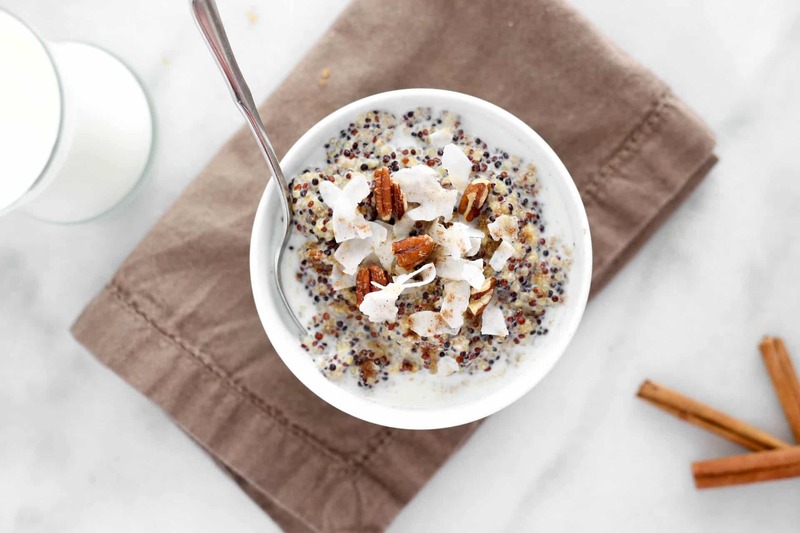 Not only does milk offer 8 grams of high-quality protein per cup, it also has other essential nutrients like calcium and vitamin D. The star grain in this dish, quinoa, is also a good source of protein plus filling fiber. If you want to see more on how milk’s protein can help at breakfast, check out this cool infographic. 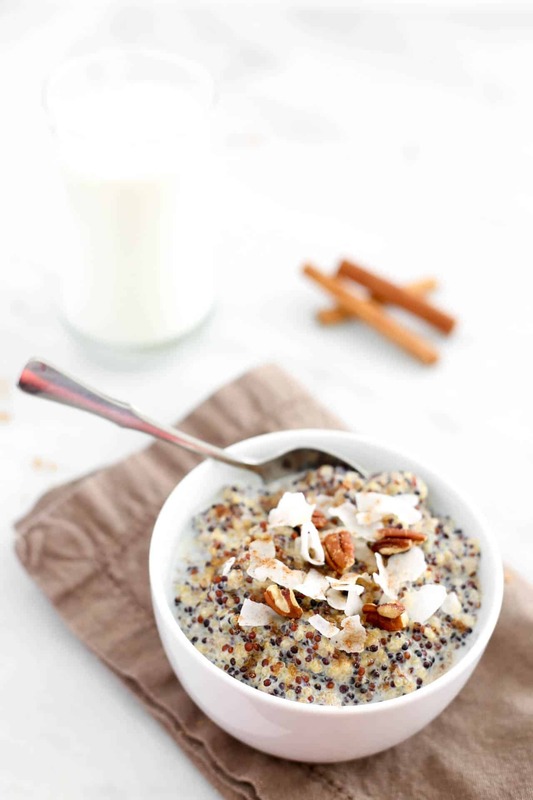 Even if pumpkin spice is everything nice in your life right now, make this spiced chai breakfast quinoa tomorrow morning and see if you don’t fall in love, too. 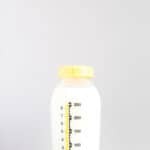 Bring milk to a full simmer in a small saucepan. Add quinoa, return to a simmer and reduce heat to the lowest setting. Cover, leaving a tiny crack for steam to escape, and simmer until about two-thirds of the milk has been absorbed, about 15 minutes. Remove from heat and stir in egg white, brown sugar, vanilla and spices. Return pan to stove, covering again with a tiny crack for steam to escape, and continue to cook on low until almost all the milk has been absorbed, about 5 minutes. If desired, serve with additional milk and garnish with coconut flakes, nuts and/or additional brown sugar. P.S. For more delicious breakfast ideas with protein, check out this Creamy Acai Smoothie, Nutty Blueberry Quinoa Oatmeal and Savory Oatmeal. 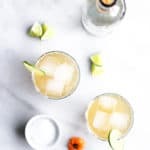 A special thanks to Milk Life for sponsoring this delicious recipe! My winter “go-to” is Oatmeal cooked in the Rice Cooker. Done in 10 minutes using 3/4 cup 5 minute rolled oats and 1-1/2 cup water/milk. So, so easy and no boil overs!!! Will have to see how to adapt this one to cook in the Rice Cooker as well. 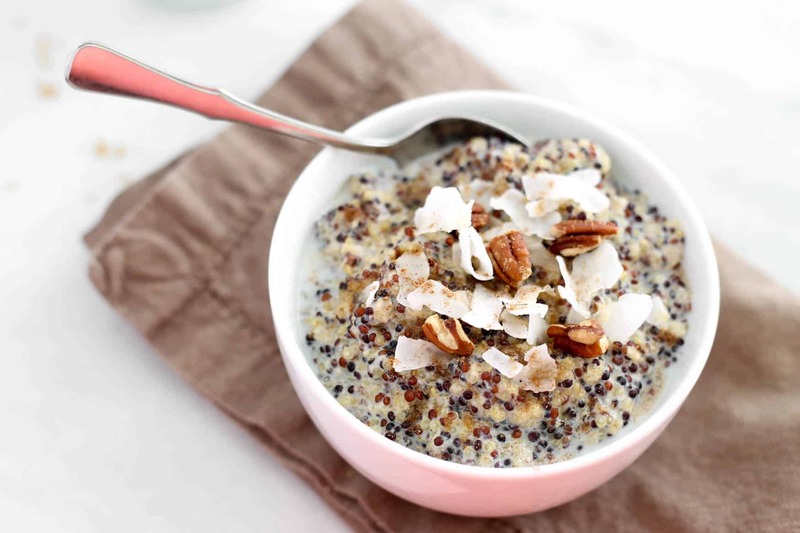 I love the idea of quinoa for breakfast! I’ll have to give this a try! I normally am obsessed with oatmeal in the morning but this is so unique! Thanks a lot for your unique quinoa recipe. I prefer healthy diet and of course I will try to cook it next week. I have always made it with 1 cup red quinoa cooked with 2 cups almond silk milk. I cook about 8 minutes in microwave until all the little grains have sort of spiraled out. Then I stir in 1 teaspoon of butter and 1/2 teaspoon ground cinnamon. This is delicious for breakfast. Or just any time of day! I tried this this morning , with a couple of adaptions as I wanted a little more protein so I made my quinoa with almond milk and then stirred in the mixed spices and one scoop of vanilla protein. I’ve splodged a blob of peanut butter and sliced apple on the top of mine and it’s divine! I’m in the UK so it’s not 4am here! The addition of peanut butter sounds amazing! I also made this this morning with soya milk and it was divine! Added a banana too to give a little more of a boost for my afternoon run soon! I also wonder if anyone has tried this with quinoa flakes cereal and/or the overnight soak method? Love that convenience, my mornings are BUSY! Has anyone tried this reheated or cold? I make a big batch of this on Sunday night and eat it All week. Warms up perfectly on the stove in about 2 minutes. My changes: no egg and I use coconut milk. How does this hold up if I were to save the second serving for the next day’s breakfast? Could it be eaten cold like overnight oats? Or does it reheat ok? Any thoughts? How could I do this without the egg white? I can’tell eat eggs but need the protein. How much protein is lost by omitting it? Or, does consistency change? This sounds so good! Do we know cals per serving? 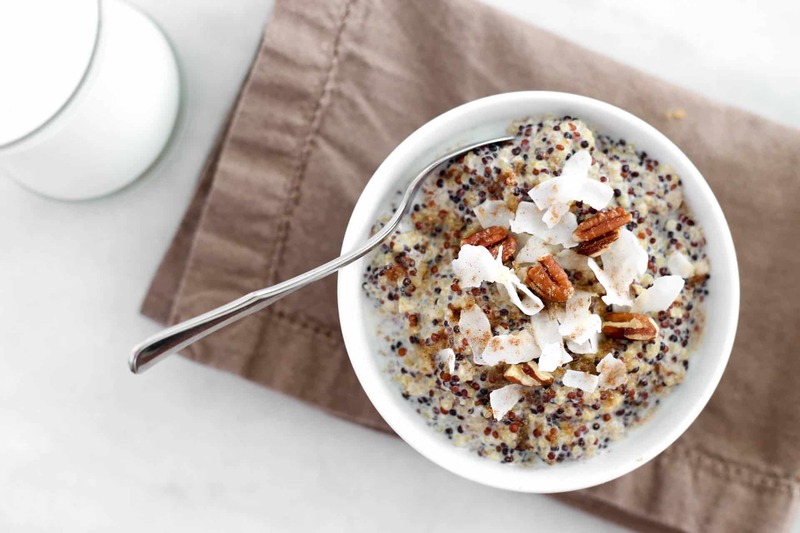 Quinoa as breakfast… I’m gonna try it! Thanks for this idea. You know, I think that chai is the fall flavor underdog. I’ve been loving my vanilla chai tea lately! The rich combination of spices is so comforting. I love sweet quinoas, thanks for the recipe! Making Chai tea latte has become my little morning ritual, I steep the tea, warm the milk and that first sip of warm concotion always makes me feel better. I love the flavour of chai and you just changed my life. I often eat quinoa for breakfast, but I would never think of spicing it with Chai spices. I love it!